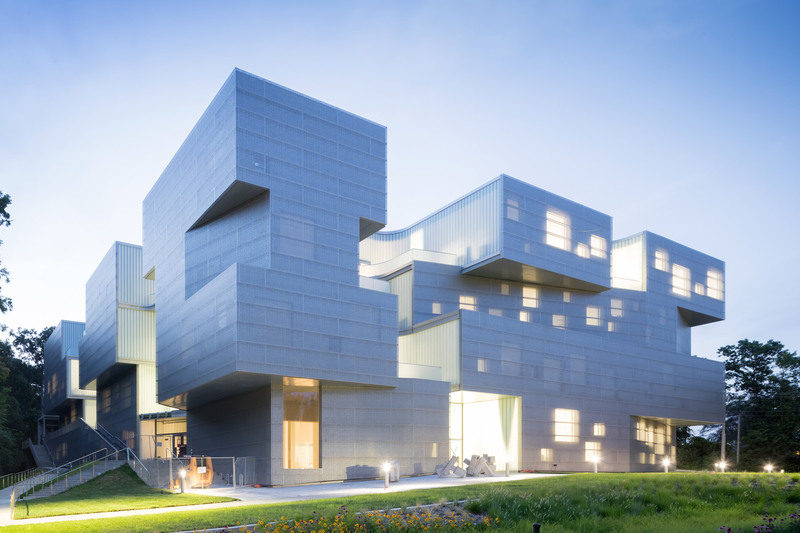 While it is rare that an architect is given the chance to build adjacently to a former project, this was the case for Steven Holl Architects’ latest addition to the University of Iowa campus, in Iowa City, Iowa. 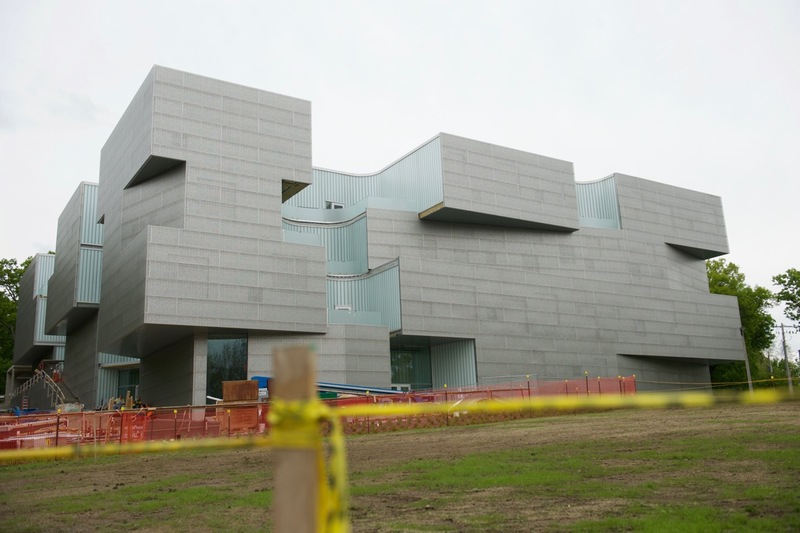 The Steven Holl-designed University of Iowa Visual Arts Building has nearly finished construction. The four story, 126,000 square foot building is designed around a central atrium and brings together a diverse array of traditional art disciplines like ceramics, printmaking, sculpture, painting and drawing with more digitally-minded photography, 3-D design, graphic design, and video art departments. This new structure is replacing the original arts building, built in 1936, that was demolished after being heavily damaged in a 2008 flood. The articulated building’s facade is clad in blue-green Rheinzink panels that are interrupted by expanses of floor to ceiling glass or square-punched openings, depending on the exposure. These panels are perforated along the southwest and southeast facades of the building. The Visual Arts Building is Holl’s second at University of Iowa, with the adjacent Arts Building West, completed in 2006, featuring a similar and complementary facade design. Certain portions of the building’s facades pull back from the perimeter, creating interior light wells and walls for more glazing. Interior light wells are also carved out from the building’s mass. The resulting swiss cheese-reminiscent floor plan allows for a variety of intimate, loft-like spaces where students can work. These lofts are accessed visually and physically via the atrium’s central stair, whose runs and landings are sized to encourage congregation and social interaction. Summer classes are set to begin in the building soon as construction wraps up. The structure will open fully to students for the Fall semester.